An influential quilt designer of the early 1900s, Marie Webster was the first person to write a history of quilts, and she was also an astute businesswoman. Her floral appliqué designs, created at the height of the Arts and Crafts movement, are still widely appreciated and imitated today. Born in the town of Wabash in northern Indiana, Marie was the oldest of the six children of Josiah Scott Daugherty and Minerva Harriet Lamoureaux Daugherty. Both of her parents' families had migrated westward from Ohio about 1850 and settled as pioneer farmers in the fertile Wabash River Valley. Josiah became a prosperous businessman and bank president. Minerva was an excellent needlewoman who taught her three daughters those plain and fancy sewing skills so important to domestic life in the nineteenth century. Marie received her only formal education in the Wabash public schools, graduating from high school in 1878. Her ambition was to acquire a higher education, but her parents considered her too frail to leave home. (She turned out to be anything but frail, outliving all her younger brothers and sisters to reach the age of ninety-seven.) There is no record that she ever took art classes, but she was a voracious reader and studied Greek and Latin at home. In 1884, she married a young businessman, George Webster Jr., of nearby Marion, Indiana, who would become a respected banker and civic leader. After his death in 1938, Marie continued to live in Marion until 1942, when she retired from her quilt pattern business and went to live with her son's family in Princeton, New Jersey, where she died on August 29, 1956. Although Marie had made a crazy quilt in 1880, she did not start making appliqué quilts until about 1905. Unable to find a pattern that she liked, she decided to design one of her own. An elaboration of the traditional Rose of Sharon pattern, Marie's first quilt design was later renamed American Beauty Rose. She sent the quilt to Ladies' Home Journal, the leading women's magazine of the day, which was actively soliciting new ideas from its readers. There her quilt caught the eye of the Journal's editor, Arts and Crafts advocate Edward Bok. When he invited her to submit more designs for a full-color page, she created her Iris, Snowflake, and Wind Blown Tulip quilts. Illustrated in the January 1, 1911, issue of the Journal, these four innovative designs were viewed by some one and a half million women. Overnight, Marie Webster became a national celebrity. The demand for her patterns was so great that soon she was filling orders from her home. The pattern packets, costing fifty cents, included a photo of the quilt, brief directions and fabric swatches, and full-size blueprints of the pattern pieces and colored tissue paper guides showing how to arrange the leaves and petals. Marie Webster was incredibly productive during the decade from 1911 to 1921. Five additional articles in Ladies' Home Journal showed twelve new quilts and nine pillow designs. She studied the flowers in her garden, creating a naturalism in her appliqué, enhanced by her use of linen fabrics in solid pastel colors. Some of her patterns revived the central medallion style of the mid-nineteenth century, with graceful scalloped borders framing the central design. 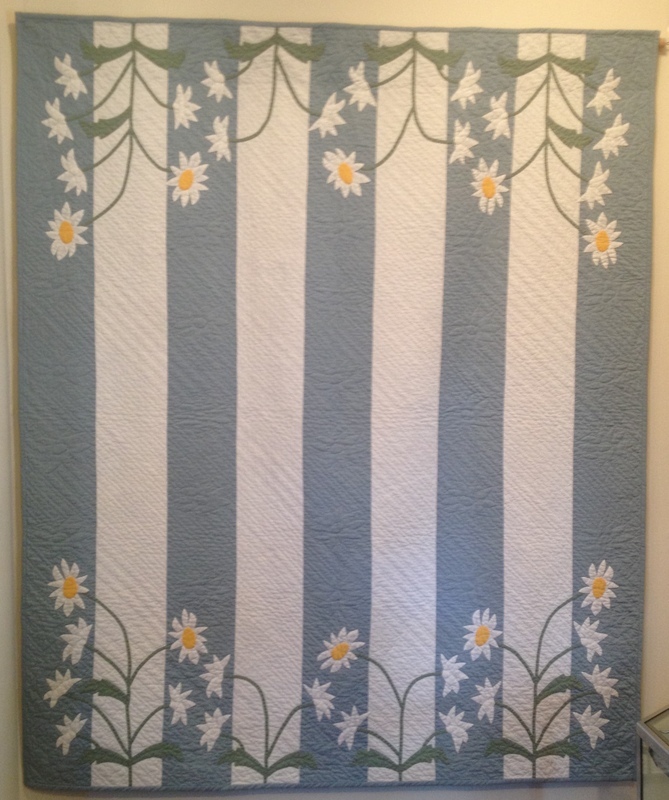 While most of the quilting was done by others to her specifications, her own appliqué was exquisite. While creating new designs, she was also busy researching and writing Quilts: Their Story and How to Make Them, the first book devoted entirely to the subject, with many photos of antique quilts and of her own designs. The book was published in October 1915 to glowing reviews and an avalanche of enthusiastic letters from quilt lovers around the world. She lectured extensively, often dressed in a period gown. Her mail-order pattern business thrived. 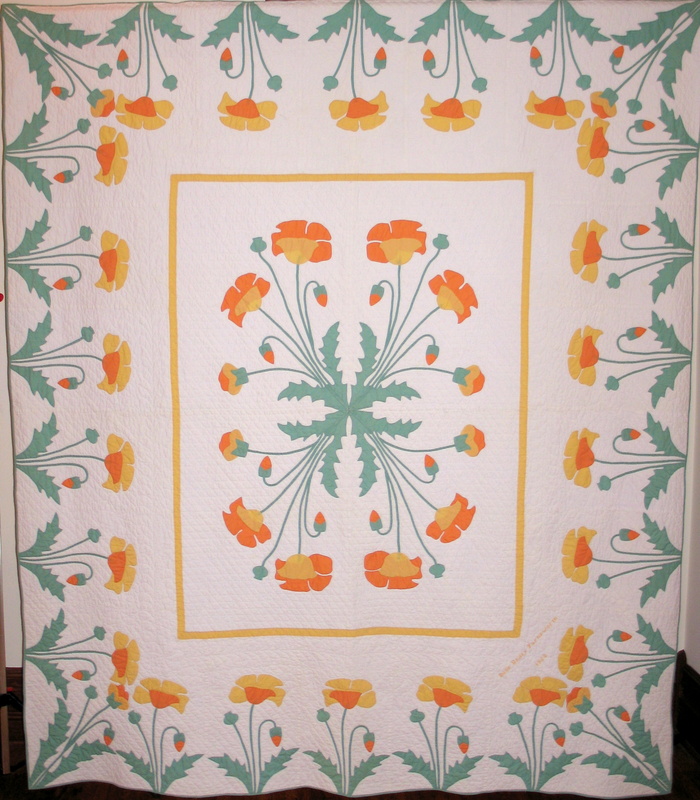 As the quilt revival gained momentum after World War I, Marie decided to sell kits, basted quilts, and finished quilts in addition to the patterns. In 1921, her sister Emma Daugherty, and two friends, Ida Hess and Evangeline Beshore, joined her in a new business venture, the Practical Patchwork Company. Their products were promoted through ads in women's magazines and illustrated catalogs, and were sold by well-known retailers like Eleanor Beard Co., A.M. Caden and Mary McElwain. Marie continued to design new patterns until about 1930 and was involved with the business until her retirement in 1942. Hers had been a remarkable thirty-year career of designing, writing, lecturing, judging quilt contests, and conducting a thriving cottage industry. Marie Webster's influence was far reaching. In 1916, Dr. William Rush Dunton Jr., wrote to her after reading her book, which inspired him to advocate quiltmaking as a form of occupational therapy for his patients. They corresponded again in the 1930s, when Dunton sought her advice about publishing his book Old Quilts. 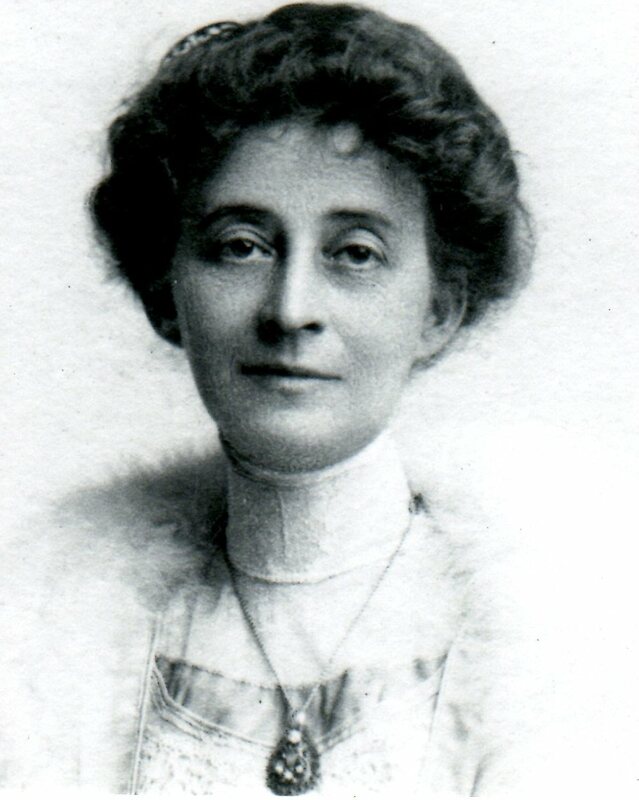 Rose Kretsinger also was inspired by Marie Webster, stating in a letter to Ruth Finley in 1929 that she had received "such encouragement from [Mrs. Webster's] kind letters to me." The style of pastel floral appliqué that Marie popularized through Ladies' Home Journal articles was widely adopted by professional designers in the 1920s and 1930s. Quilts: Their Story and How to Make Them also had a significant impact. It legitimized the serious study of quilt history and celebrated the importance of women's artistic efforts. Its success demonstrated the broad appeal of the subject of quilts, not only to quiltmakers, but to a much wider audience that appreciated the artistic and social importance of these artifacts. Furthermore, it was the only quilt book in print until 1929, when Ruth Finley's Old Patchwork Quilts and the Women Who Made Them was published. Even in the early 1970s, when the late twentieth-century quilt revival began, Webster's book was one of the few available for use by a new generation of quiltmakers and quilt historians. Marie Webster's designs appear frequently in quilt magazines, and her book is often cited in contemporary writing on quilt history. Quilt lovers both here and abroad have seen her quilts. A retrospective exhibit of her quilts mounted by the Indianapolis Museum of Art traveled to several venues around the United Stated from 1991 to 1994. Her quilts were also featured in an exhibit that toured Japan in 1998, American Quilt Renaissance: Three Women Who Influenced Quiltmaking in the Early 20th Century, together with work by the Quilters Hall of Fame honorees Rose Kretsinger and Carrie Hall. In 1999, Marie's Grapes and Vines quilt was selected as one of America's 100 Best Quilts of the 20th Century. The Quilters Hall of Fame has showcased Marie Webster's quilts in three special exhibits. The organization's very first exhibit, in July 1992, was The Quilters Hall of Fame Celebrates Marie Webster. Marie Webster's Garden of Quilts was shown in July 2009, celebrating the 150th anniversary of her birth. In 2010, another selection of quilts, both old and new, made from her patterns, was exhibited in The Quilters Hall of Fame: Marie Webster Quilts: A Homecoming. In recognition of her pioneering work, Marie Webster was inducted into The Quilters Hall of Fame in 1991. A most modest woman, she did not seek fame for herself. Her legacy, as she would have wished, is inspiring others to create quilts, to appreciate quilting as an art form, and to preserve this heritage for the future. She would have been delighted to know that her home would one day become The Quilters Hall of Fame. "Among the few home occupations that have survived is quilting... More quilts are being made at the present time and over a wider area than ever before." 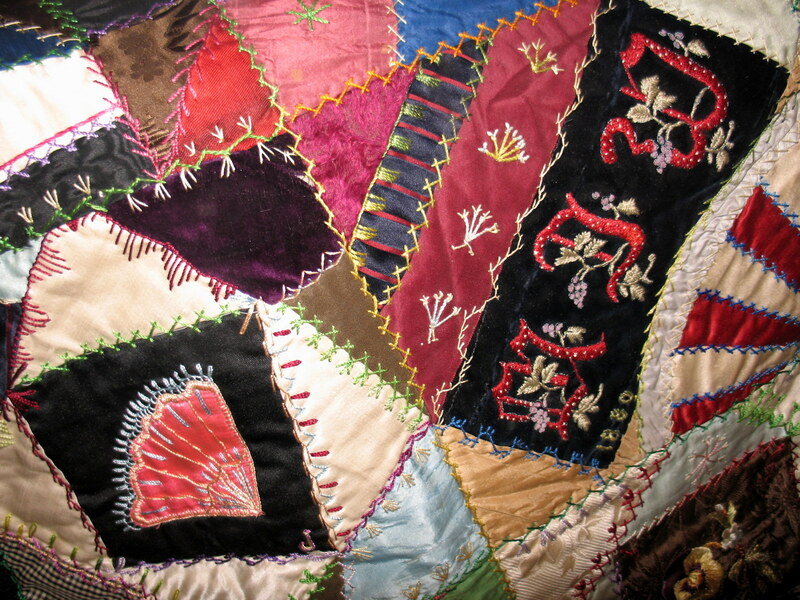 Detail of Marie's Crazy Quilt dated 1880. Poppy, designed by Marie Webster and first published in 1912. Daisies designed by Marie Webster and first published in 1912. Benberry, Cuesta. "Marie Webster: Indiana's Gift to American Quilts." Quilts of Indiana. Indiana Quilt Registry Project. Bloomington: Indiana University Press, 1991, 88-93. -------. "Marie D. Webster: A Major Influence on Quilt Design in the 20th Century." Quilter's Newsletter Magazine, no. 224 (July/August 1990): 32-35. Perry, Rosalind Webster, and Marty Frolli. A Joy Forever: Marie Webster's Quilt Patterns. Santa Barbara, CA: Practical Patchwork, 1992. ------. Marie Webster's Garden of Quilts. Santa Barbara, CA: Practical Patchwork, 2001. Webster, Marie D. Quilts: Their Story and How to Make Them. Garden City, NY: Doubleday, Page & Co., 1915. Expanded edition with color illustrations, notes, bibliography, and biography of the author by Rosalind Webster Perry. Santa Barbara, CA: Practical Patchwork, 1990.